Seems horses and dogs get most of the attention. We do have other critters; birds and bunnies and in the past we were able to share in the antics of sugar gliders and chinchillas. Today I tell you about Dorothy. 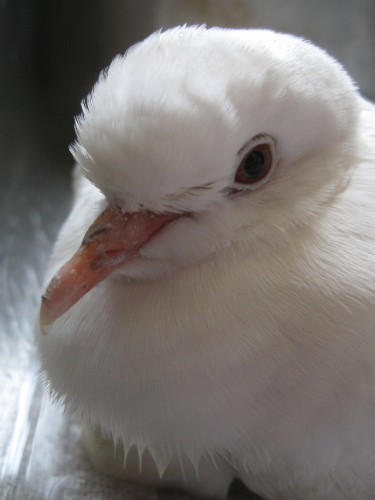 She’s a lovely white Dove. Her age is unknown but she’s been in the family a long time. She was taken into custody with several parrots by our local animal control. The fancy Parrots were all quickly scooped up but no one wanted sweet Dorothy. So, I brought her home. She’s got a melodic coo that greets each morning. She even has a crazy sounding giggle every once in a while. She is nothing but kind and courteous. Yes, a bird can be courteous. 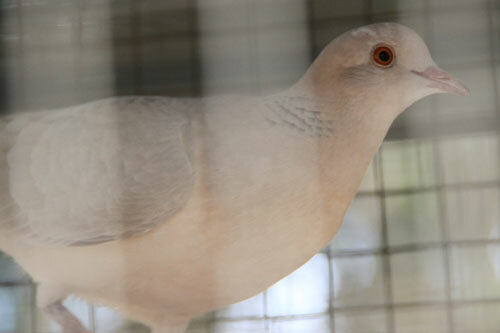 She had a racy romance with a Roller Pigeon named Felipe that begat our boy, Eggtooth – he’s part Dove part Pigeon. She’s nearing the end of her days but has not given up. To be able to better care for her she was moved from her big cage on the back porch to a hospital/hospice cage in our kitchen. Seems her legs are no longer strong enough to hold her up. 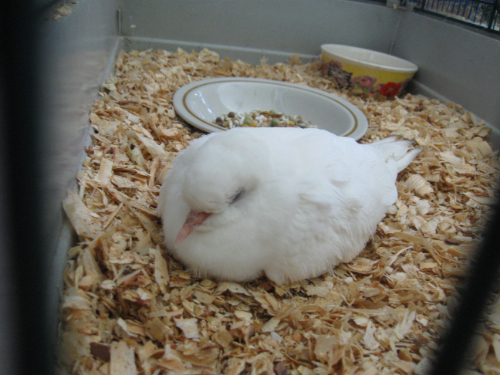 She has bedding of pine shavings to cushion her. Last week when we brought her in I really thought she’d be gone in a day or so. I feared she was eggbound but that’s obviously not the case or she would be dead. I believe she is simply weak and growing weaker even though she is eating and drinking. So, we are letting her be. 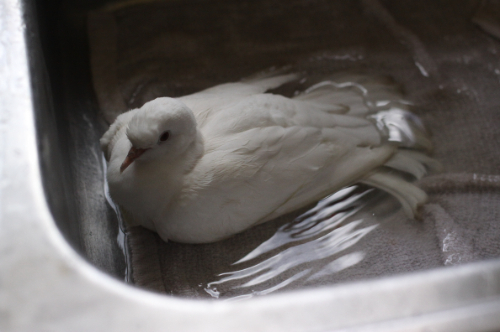 She’s enjoying the warm baths. Dorothy is no longer able to perch therefore her bottom gets dirty. She remains calm and courteous as I blow dry her. 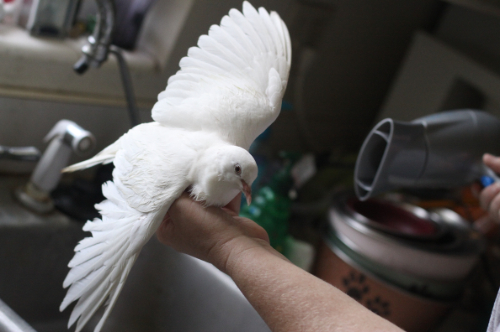 The goal from the moment I met this little bird was to give her a safe and peaceful life. Now that goal is to give her a safe and peaceful passing.